Snow White. Matt Phelan, author and illustrator. Candlewick Press, 2016. This has been on my radar since I read reviews of it last year, but you know. Life is busy. I'm glad I finally picked up a copy, and even more glad that I loved it so very much. Fairy Tales were part of my childhood, both the Disney versions and more traditional versions. If you want to know how old I am, I listened to records with ginormous headphones on that were Let's Pretend radio shows. Like...from 1934-1954, according to Wikipedia. Which is always right. So I grew up listening to things older than my parents. Which is kind of mind-bending. I love the Disney versions of these stories. They're beautiful, they're part of our culture and history. But I also love the non-Disney version. Stories older than Disney, told with new voices. 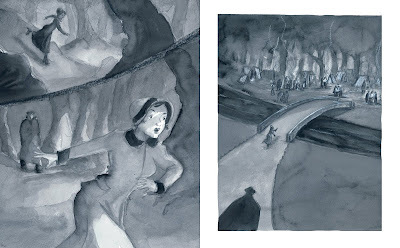 Matt Phelan's Snow White is somehow both old and new -- a beautifully drawn and painted graphic novel with some digital effects -- but set in Depression Era New York City instead of the dark forests of medieval Europe. A young mother is walking with her toddler through a snowy day in Central Park. The child's name is Samantha White, but when she doesn't return to her lovely mother, Mom calls her by her nickname, "Snow." A while later, the mother is overcome with wracking coughs, and sees her blood spatter the snow. Soon Snow and her father lose the mother, and a new woman enters the picture. Instead of an evil queen, we get a star of the Ziegfeld Follies -- a queen of Broadway, as it were. 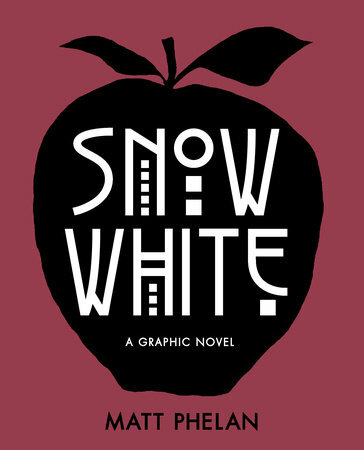 Rich, famous, and glamorous, Snow's stepmother soon sends her away to boarding school. After the sudden death of the father, and the inheritance going to Snow, we know her days are numbered, and the real intentions of the stepmother become clear. All of the pieces of the classic Snow White story are here, but transported into a different era. When Snow White flees "Mr. Hunt," she runs not into an enchanted forest, but a Hooverville. Instead of consulting a Magic Mirror, the stepmother reads a ticker tape. The other royalty that visit the family home include Rockefellers. Instead of dwarves, it's orphaned children who help Snow White when she needs them. At every turn, we get delightful tweaks on the classic story, using a period in history that I not only find fascinating, but love teaching. Mr. Phelan's black and white artwork conveys the gorgeous Art Deco styling of the period, but also the despair that afflicted so many. Bits of red punctuate the pages -- the mother's blood, Snow's lips, the poisoned apple. Every page has something new to drink in. Three thoughts came to mind while reading Snow White. First, is that while many of our students still grow up with fairy tales, many of them do not. They're likely to have encountered the Disney version of these stories, but a lot of them probably assume that (The Little Mermaid was written by Walt Disney. They wouldn't know Hans Christian Andersen, they wouldn't know that in the non-Disney version, she turns into sea foam at the end. Dying. For a man. Typical. I use fairy tales in the classroom. Disneyfied and not. When I teach students about perspective, I use a video clip from Cinderella that has the stepmother locking Cinderella in the tower, and have kids write statements going through the heads of Cinderella or the stepmother, and then comparing the two. From there, we'd move on to doing the same thing with historic characters and their own thoughts. When I introduce American Indians and stereotypes, we watch the song "What Makes the Red Man Red?" from Peter Pan, and use that as a jumping-off point to see what's good, what's bad, and what's just historically awkward. Fairy tales aren't the common currency they used to be for kids, but can still be used, and used well. A second idea is that while Matt Phelan took the Great Depression as the backdrop for this story (and wow I'm glad he did), the same story could be told using the French Revolution. Or Ancient Egypt. Or 2017 North Korea. Or...you get the idea. Taking the elements of a classic story and reconfiguring it in a world that students research -- this is a relatively simple story. A girl, a jealous parent figure, some diminuitive assistants. You could tell the Snow White story anywhere in the world, at any point in history. Why not use it? Give students a four page template, give them the requirements of the story, and have them briefly tell the Snow White story. Or Rapunzel. Or Aladdin. Or Little Red Riding Hood. The stories are out there. My third idea -- have students explore the non-Disney, and non-European versions of these tales. Cinderella Stories Around the World: 4 Beloved Tales is an excellent picture book introduction to how the same story has been told in different cultures. It's not always a glass slipper. It's not always Prince Charming. But the heart of the story is there. Other books in that series include Little Red Riding Hood, Rapunzel, Snow White, and Beauty and the Beast. Our classrooms aren't as homogenous as they used to be -- help your students see themselves in these stories. My final thought was actually just how much I like apples and eating apples of many varieties, but that I'm a teacher, and I kind of hate how the apple is the symbol of our profession. Like...I know a lot of you reading this have apples appliqued on your cardigans, and apples on your ties, and a few of you have apple tattoos. And that's good. So do I. Uh...the tie thing. But really, I wish the symbol of teaching was a brain. A quivering, wet, brai--actually, yeah. The apple's good. Apples. They're great.